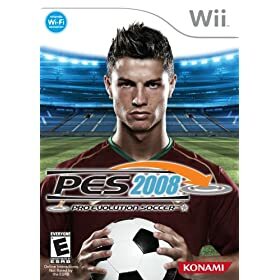 I've had PES for a few weeks and I can't stop playing it. It's all due to the revolutionary control system. I have to admit that seeing the demo movies and reading about the controls was a bit overwhelming. The display is full of arrows, circles and other indicators that at first seem to distract from the actual action on the pitch. I wondered whether the control system could work at all, whether it could be managed by a normal player. Given the respect I had for Konami going all the way back to ISS Soccer on the Nintendo 64 and all the versions of Winning Eleven I knew I had to give this one a try. In a nutshell: the control system works and the resulting game play is brilliant. Dribbling. Running with the ball is done by holding down the A button and pointing (yes! pointing) at the spot in the screen you want the player to run to. As you do this, a blue arrow is rendered on screen, from the player that you're controlling to the spot you're pointing to with the wiimote. The longer the arrow, the faster the sprint. This works amazingly well and it provides a level of control never seen before. With one simple operation (pointing) you control both the direction and speed of the player that has the ball. Previous soccer games used the analog control stick to control the direction of the run and some modifier key to sprint vs. normal running. The fluidity of the control in this version cannot be matched. Example: taking control of Messi as he receives the ball in the usual spot, right after the midfield line on the right side and then launching him into his signature high speed diagonal zig-zag to the middle of the box is exhilarating. Passing. Passing is done by pointing at a spot and hitting B. The amazingly cool aspect of this is that if you point at a teammate, you pass to them. If you point at empty space, you pass to an exact spot in empty space! People with experience with soccer games know how hard this was in the past. A hit or miss proposition. Here it is perfect. You lobe the ball pass the whole rival defense knowing your winger can beat them to it. This sort of play is where this game excels above all others, creating an incredibly real soccer experience. Shooting. Shooting is done by flicking the nunchuck. Very easy to do. When defending, the same motion clears the ball. The secret is in timing the flick, to connect a header. If instead of flicking the nunchuck you flick the wiimote, the player attempts a soft flick to lobe the ball over the head of a rushing goal keeper, a very classy way to score. You don't control where the ball goes when shooting or clearing and I don't think that's much of a loss. I did not feel that pointing the analog stick while shooting in previous versions really controlled the shot anyway. These three techniques are really all you need to play the game, at least on offense. Defense is a bit strange. Instead of controlling one of your players and making them run next to the person with the ball you point at attacking rivals to direct the closest player to defend against them. Clicking on a rushing player twice makes 2 of your players go to him. Once they are in close range the circle below your player turns read and you can slide tackle the ball away. This all sounds a bit weird and it takes some getting used to. You need to focus on the incoming attack and decide who's the most likely recipient of the next pass and cover them. Again, very much like a real game, except that you control every defender. A nice bonus is the ability to throw an offside trap with great ease. Lift the wiimote and your line of defenders moves up leaving attacking players offside. Extremely satisfying with good timing and horribly embarrassing when messed up. Like in a real game. That's about it. Other aspects of the game are good and don't get in the way. What sets this game appart from all others is the brilliant control scheme. Never before has it felt so natural and fluid. At this point they only thing I can think of that could take this game to the next level for me would be to replace the narrators with the amazing Ray Hudson. Seriously, how is it possible that game makers have not discovered this amazing talent? A soccer game with Ray narrating would be incredibly exciting. Couldn't agree more A great game and leaves even EA FiFA 2009 for dead.